This software is provided as Freeware. You may copy and redistribute it freely. However, you may not make changes to this software, and you may not charge for it. This software is provided as-is. We have done our best to ensure that it works properly, however there is no warranty, and there is no support. Download the EnWarehouse.zip file. Extract the contents to media local to your computer. Run the Setup.exe program. A shortcut will be created in your Start menu. After installation, the .zip file and its extracted contents can be deleted. Get a TamaTown Log In No. from the Tamagotchi. Enter this number into the box near the top left of EnWarehouse. Click the Login button to validate the number. Click the Menu button to open the item menu. Move the mouse through the item menu, and click on the desired item. Enter the number from the box near the bottom left of EnWarehouse, into the Tamagotchi, as the Log Out No. Your selected item will arrive on the Tamagotchi. Items listed in the Purchases branch of the menu are chargeable. If you agree to accept a purchase item, the cost will be deducted from your Tamagotchi's $G$ points. Click the Clear button to reset the Log In and Log Out Numbers displayed. Instead of using the Menu button, you can click the middle button to quickly reselect the most recently selected item. Navigate to the "Add or Remove Programs" applet in the Control Panel. 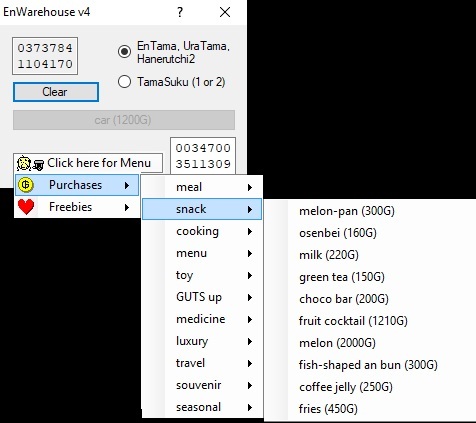 Select the entry for EnWarehouse, and click "Change/Remove".